Homemade Savoiardi Biscuits...or Lady Fingers I've always wanted to make savoiardi biscuits(or lady fingers) at home. But I do have to admit that buying them was much, much easier... at least that's how it was when I lived in a big city. You can find almost anything you need in a big city and the savoiardi biscuits aren't expensive at all...especially if you buy them at international markets. I never bothered making them at home, mostly because the biscuits were so readily available. But it's a different story here in Montana. The regular supermarkets don't really carry them... at least I couldn't find any that did. However, I did end up finding them at a specialty store, but they don't always stock them. And they also cost quite a bit more than what I was used to paying back home(that's actually funny because it was years ago when I used to buy them, and prices have changed:).... In any case, that's when I finally made up my mind to make them at home. I'm glad.... because the homemade version tasted so much better...fresh, the way they should be:). Besides, you get this wonderful satisfaction that you've made them from scratch:). 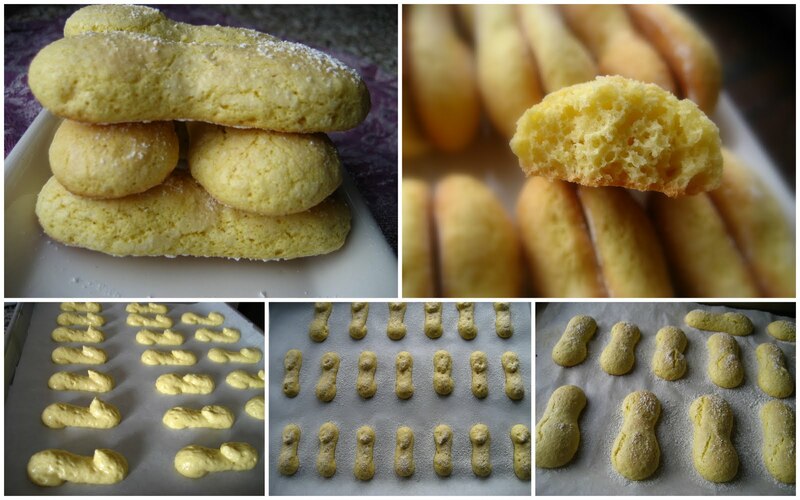 There are plenty of recipes on the net for savoiardi biscuits, but I finally settled on using Baking Obsession's recipe....they looked absolutely fantastic and I love her recipes. The neat thing about making them at home is that you can play around with some of the flavorings... depending on how the savoiardi are used . You could use a bit of orange/lemon oil for a fruit based dessert....or almond for a nutty dessert, etc. *You can use all purpose flour and replace 2 TBS of it with 2 TBS corn starch...then sift it together. eat the egg whites until soft peaks form. Gradually, add 4 TBS sugar. Beat until the egg whites form firm peaks that are glossy and smooth. e whipped whites into the yolks to lighten them up. 7. 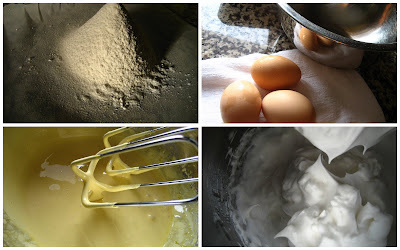 Add half of the remaining whites over the yolk mixture and then sift about half of the flour over the egg whites. Gently fold until the ingredients are barely combined. 8. Add the rest of the whites over the yolk mixture and then sift the rest of the flour over the whole mixture. Fold gently until combined. Try not overdo the folding, otherwise the batter will deflate and lose volume... and then the ladyfingers will be flat and not spongy. 10. Pipe the batter into 3-4 inch long strips...I like to sort of make them S-shaped( it gives then a bit of a lift). Sprinkle some confectioner’s sugar over the surface of the savoiardi biscuits... and wait for 5 minutes. 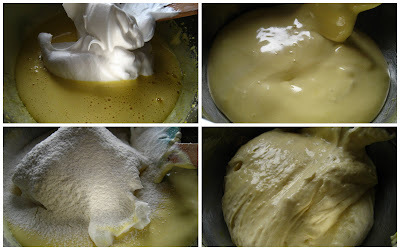 The batter will absorb a bit of the sugar. Wow Ellie, they look perfect, I actually thought they were store bought for a second :) It's amazing what your hands can do!!! Have a lovely day! Ellie, I am simply amazed by what you can do. Post after post! It seems like you can cook or bake anything! Mihaela...you are too, too smart:)! Raveica, You know, when I started this blog, I never dreamed that I would be of help to anyone...it was( and still is) truly a means for me to document recipes I love. So it means a great deal that you took the time to comment. So very glad I could be of help and glad you enjoyed the placinta cu branza(our favorite)....even better that I was able to bring a little memory of home:). Speranta, nu este de loc complicat...multumesc pentru vizita! I thought I was seeing the building blocks of tiramisu, glad to hear I was right. :) Not just homemade tiramisu but one with homemade savoiardi and homemade mascarpone. Ellie, you ara amazing!